The opera The Dybbuk by the American composer Solomon Epstein is based on S. An-Sky’s 1920 play, which has become a legend in Jewish culture. The opera was premiered in Tel-Aviv, 1999, and is apparently the world’s first original yiddish opera. Yiddish, spoken mainly by European Jews up until World War II, is now an endangered language, and with it a rich cultural heritage threatened with being lost forever. Before rehearsals began, most company members did not know Yiddish. The Dybbuk is a tale, which takes place in a small Jewish town where the souls of both the living and the dead transcend their respective realms. Leah falls in love with Hanan, a Kabbalah student. Soon after Hanan is overcome by powers beyond his control and dies, a male voice emanates from Leah’s body. The spirit of Hanan has taken control of her in the form of a demon, a dybbuk, and refuses to leave. In this respect, the Dybbuk is a passionate play which was destined to become an opera: An especially riveting moment occurs in the excorcism scene when soprano, Leah start singing and Hanan’s tenor voice is heard, and an elusive vocal exchange begins. The Dybbuk, is an Israeli production, directed by Rachel Michaeli and conducted by Ronen Borshevsky. 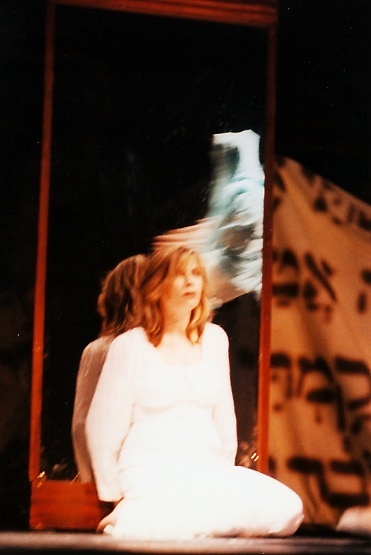 Lea, in Michaeli's Dybbuk, clings to the Dybbuk which possesses her, and protects him from those who try to banish him from her. This is a contemporary opera which reflects the music of the period when the play was written. In addition to Debussy’s and Bartok’s spirit, The Dybbuk leaves space for the Jewish musical tradition. The production is staged in an abridged version (70 min. ), with cast of singers and actors accompanied by pianist Irit Rub-Levy, Starring, Swedish soprano Camilla Griehsel.